The Great Bustard is a globally threatened bird, and Spain is one of its last strongholds. Fifty per cent of the European population lives there but they are still in decline. Extremadura is on the borders between Spain and Portugal. 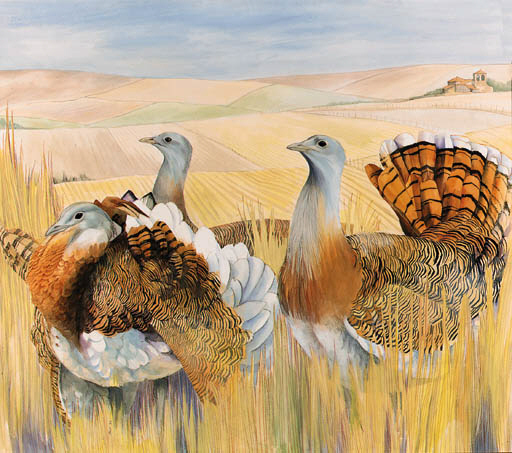 The following watercolours by Emma Faull of threatened birds and the oil painting of Ptarmigan are being sold on behalf of BirdLife International to raise money for their worldwide work to conserve threatened bird species and their natural habitat. Emma Faull was described by the late Sir Peter Scott as 'an artist of great distinction'. He wrote: 'Her bird paintings are large, scientifically accurate and enormously decorative. Hers is a very exciting talent.' Faull has always been concerned with threatened birds and this concern has resulted in her concentrating on painting such species both in the wild and in zoos. Her eye for detail and her accurate recording is reflected in her life-size watercolours that capture the detail and immediacy of birds in the wild. Faull has exhibited her paintings throughout the world and has also exhibited regularly in London. This year she has been working on a private commission from the Commonwealth to paint a gift for the Queen and Prince Philip to celebrate their golden wedding. The picture will be presented by the heads of the Commonwealth States in October 1997.